iOS 12 has a slew of exciting new features, like the Augmented Reality capabilities, animated emoji, Siri translation ability, multi-tasking and more. There is no doubt that many users are eager to update to iOS 12. However, iOS update is no trouble-free. Problems creep up every year, and sadly it's no different with iOS 11. Even with all the improvements or bug fixes in iOS 12, people are still experiencing "iPhone stuck on Slide to Upgrade" problems. Luckily, when your iPad or iPhone gets stuck on Slide to Upgrade screen for iOS 12 update, there are many solid fixes to try out. Below we have gathered all the proved fixes to the problem. These solutions apply to iPhone XS/XS Max/XR/X/8/Plus/7/6s/6 or earlier with the frozen Slide to Upgrade screen error. 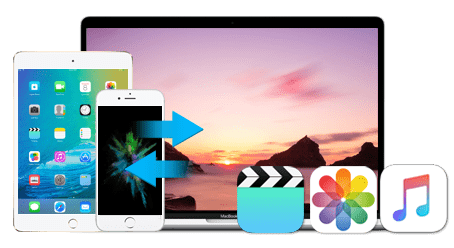 MacX MediaTrans - it helps transfer, backup and manage files covering photos, music, videos, ringtones, iTunes purchases, DRM contents, documents etc. from iOS to Mac via drag and drop; make ringtones, remove DRM, convert files, delete/organize songs, photos and more; and restore data from Mac to iPhone iPad in clicks. What to Do if iPad iPhone Frozen on Slide to Upgrade Screen? Step 1: Connect your iPad or iPhone to computer and launch iTunes (download the latest version). Step 2: Select your device from the iTunes window. If your device doesn't show up, hold the power and home button to force restart iPhone. And then you should see your device. Step 3: Now restore the iPhone from a recent backup. If you haven't backed up your device recently, you can backup iPhone in iTunes now, and then restore from that backup. This is Apple's official fix to "iPhone stuck on Slide to Upgrade" error. Note: To fix iPhone gets stuck on slide to upgrade screen this way, it requires the "Find my iPhone" disabled. As the iPhone is stuck on Slide to Upgrade screen, you can do it in another way: login your iCloud account and remove the Apple ID from the associated device. Or find the feature under iCloud and disable it with the iCloud password. Step 1: Download iOS 12 full and final IPSW update from https://ipsw.me/. Step 2: Connect the problem iPad or iPhone to computer, and open iTunes. Select device from iTunes. Step 3: On Mac, hold down the "Option" key and click "Update"; on a PC, hold down the "Shift" key and click "Update" button in iTunes. Step 4: Browse the file and select the IPSW file you just downloaded. Then click Choose. Then the iPhone will update to iOS 12 and fix the iPhone frozen on Slide to Upgrade problem. Step 1: Connect stuck iPhone to computer, and download the latest version of iTunes. Step 2: Hold power and home button the same time until iTunes symbol appears. Step 3: Click restore iPhone, then select "Set up as a new iPhone". Note: "Set up as a new iPhone" can solve the iPhone slide to upgrade loop problems caused by partial software errors. However, if you set iPhone as a new one, the settings and other data on the stuck iPhone will be erased, including all the contacts, text messages, music, photos and other files. You're strongly suggested to make a backup first. Also check how to set up new iPhone X. Step 1: Connect iPhone to computer and run iTunes. Then turn the iPhone off. Step 2: Press and hold down the On/Off button on the right side of your device for 3 seconds. Step 3：Press and hold down the volume down button on the left side of your iPhone while still holding down the On/Off button. Step 6: Restore iPhone. Then you can set it up as a new iPhone. Get help here if your iPhone gets stuck on reboot loop. In addition to the above widely-used fixes, there are users providing other tips to help fix the Slide to Upgrade loop on iPhone. Tip 2: Hard reset the device. You can do it by keeping pressing the lock button constantly and then let go. You can do it for multiple times. Tip 3: If still iPhone stuck on slide to upgrade screen and nothing works, try to downgrade from iOS 12 to earlier iOS. Also learn how to fix a bricked iPhone. The solutions above should help you go pass the slide on upgrade loop on iPhone or iPad. However, if the painful "Slide to Upgrade" screen still exists, you can go to Apple Store to ask for help. If you have any other solutions to help the iphone frozen on slide to upgrade problem, please share a comment below.